Based upon the esoteric workings of the Secret Order of the Golden Dawn, reconstructed & drawn by Godfrey Dowson. Measurements: 2.75 x 4.35 inches; or 70 x 110 millimeters. Back of card: Heavy ornate black border with ornate six pointed star in center of white field. In the four corners, two flowers (roses?) & two formal Stars of David. Not quite symmetric, but will work if you don't look closely. On the other hand, the back doesn't contrast well with the front. Booklet included: Yes, 48 pages, 2.63 x 4.2 inches, or 66 x 107 mm. Instructions by Godfrey Dowson & Stuart Kaplan, edited by James Wasserman. Publisher: US Games. Printed in Spain. Comments: We confess the light at our desk is soft, so when we first saw this deck, we were hard pressed to see the detail in the cards. We've just put a lamp next to us & in the stronger light, these cards have a lot more impact. The Secret Order of the Golden Dawn was one of a number of secret esoteric societies that flourished in the closing days of the 19th century. One of the members of this group (probably in collaboration with the others), MacGregor Mathers produced a mysterious master tarot deck which other members (among them, A.E. Waite, Aleister Crowley & Paul Case) later used to develop their own decks, all of which are justifiably famous. According to the notes, Mathers's original deck has not been handed down. This is evasive. Unless it's been deliberately destroyed (which sometimes happens to esoteric materials), the deck is presumably still in existence & still secret. 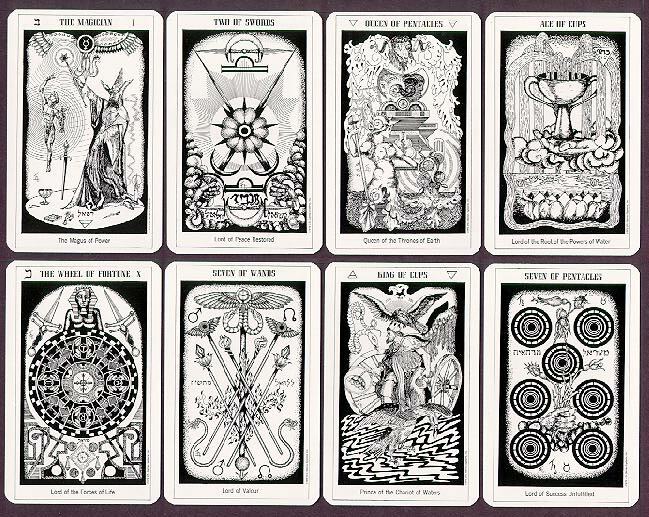 The Hermetic Tarot is an alleged recreation of that deck. The artist, Godfrey Dowson, studied the society's secret papers, as well as the three classic decks members of the society produced. This deck was created between 1975 & 1977. The society studied symbols intensely & established detailed relationships between kabalism, astrology & the tarot. So you will find a wealth of detail on these cards. A strong light & sharp eyes help, too. Suits are Swords, Wands, Cups & Pentacles. Court cards are King, Queen, Knight & Princess. The title of each card is given at the top, the subtitle (not a definition) is given at the bottom.